Not many people know that Andrea misspent a bit of her youth becoming the queen of Tetris. In fact she is still a dab hand and can score in the millions if she puts her mind to it. This may not seem too relevant for her role as innkeeper but actually it underlies a fabulous talent for spatial visualization that has come in very handy – especially when redesigning our guest rooms. Take for example the Chestnut Room. 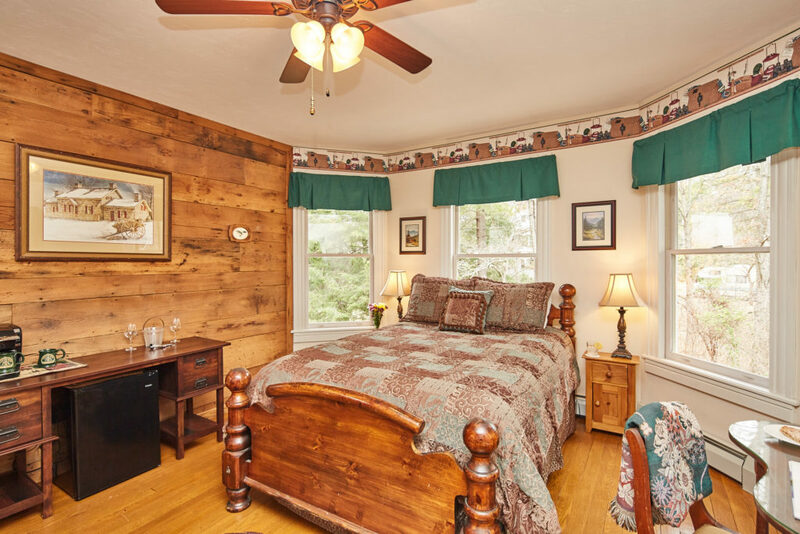 This is the Andon-Reid Inn’s most economical guest accommodation but is a charming lodge-themed room featuring a wall fully paneled in wormy chestnut planks recovered from the original 1902 carriage house. The Chestnut Room has a comfortable queen sized bed, gas-log fireplace, sitting area, all the usual Andon-Reid Inn amenities and a nice en-suite bathroom with traditional tub-shower. However, for quite a while we felt that we were not making the best of the Chestnut Room. Despite being reasonably spacious (around 300 square feet) it felt a little more cramped than it should have. I couldn’t pinpoint the cause and we left it alone until one late winter afternoon while we were doing a deep clean of the room. Having pulled all the furniture out for cleaning, Andrea’s Tetris skills came into play. She shuffled the furniture around, including turning the bed 90 degrees to nestle in front of the bay window. The transformation of the Chestnut Room was nothing short of incredible. The feel of the room opened up completely and there was now much more space around the sitting area. This prompted us to replace some of the old oversized furniture, including swapping the old highboy with a table that now comfortably accommodates the mini fridge, Keurig, wine glasses and ice bucket. 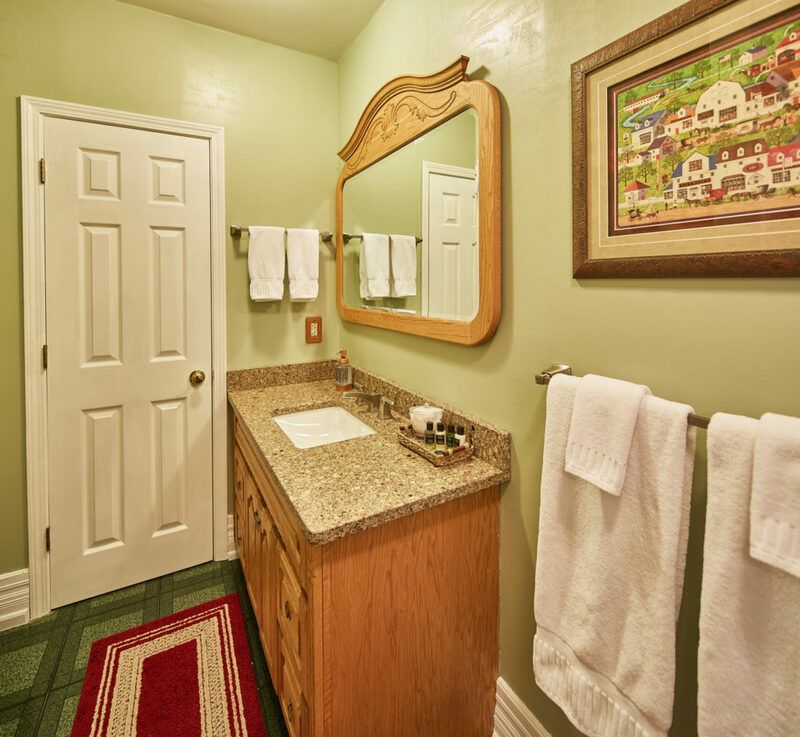 The remodeling of the bedroom motivated us to refresh the bathroom as well. We have added a new granite countertop and sink, and have replaced the fading striped wall paper with a bright coat of fresh paint. Guests staying in the revamped Chestnut Room have been very pleasantly surprised by the changes. We we hope you will too. Book on line or give us a call on (828) 452 3089 to reserve a few nights at the Andon-Reid Inn and come and see for yourselves. This entry was posted in The Inn by admin. Bookmark the permalink.